For loads of fun and family time, count on Swing Kingdom. A family operated manufacturer of premier vinyl swing sets, we strive to design and build fine quality, and affordable swing sets perfect for children of all ages. Ours are virtually maintenance-free swing sets. We were the first manufacturer to combine PVC and structural wood, along with stainless steel corner brackets and hardware for superior strength. Today, we continue to use only the finest quality materials to ensure safe, durable swing sets built to offer years of enjoyment. Swing Kingdom was founded in 2000 with a passion for play. Our revolutionary vinyl-clad system has proven to be extremely safe and has tremendous lifetime value. Today we are the largest vinyl play set manufacturer in the United States. Swing Kingdom builds the strongest vinyl play sets on the market. Our passion remains in play because it is such an important factor in children's physical and emotional health, and in social and academic development. Most of all, it can build priceless relationships between children and parents. We are committed to building safe play spaces for children. Vinyl is more durable. Swing Kingdom's vinyl and decking products are the best and most uniform material available in the industry. Our vinyl is co-extruded under extreme pressure to assure a durable and beautiful finish for years to come. Vinyl is stronger. Our vinyl has five times the tensile strength and four times the flexibility of wood. Vinyl is easier to maintain. You can easily use a garden hose, some glass cleaner and a soft bristled brush to wash away dirt and debris. Vinyl protects the wood structure. 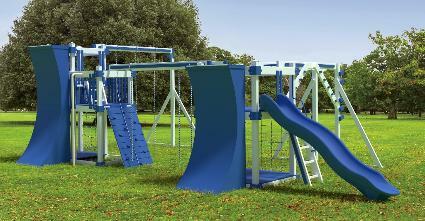 Wooden structural elements of our play sets are covered to preserve them and to reduce maintenance.